The SR177 is being built to OR337, issued by the Air Staff on 2nd December, 1955. This is a development of an earlier requirement, O. R.301, first issued in 1951. The aircraft being built to this latter requirement is the S. R.53. May 1951. Particulars of a proposed requirement for a rocket propelled fighter were circulated to the Air Staff… Because of the limitations of the early warning system and the likely scale of enemy attack, it was thought that a large force of high performance day fighters would be required. The ability of the fighters then being developed to deal with the very high altitude raider was doubted. The aircraft proposed was intended to fill the gap until effective Guided Weapons became available and to provide a strong backing for the day fighter force against mass daylight raids of B.29 type bombers. The operational role of the aircraft was to be based on an exceptional rate of climb, probably obtainable only by rocket propulsion. Target date for the first production aircraft was Spring, 1954. The aim was to combine simplicity and ease of manufacture with operational efficiency. Certain operational refinements were therefore to be sacrificed. (a) Climb 60,000 ft. in 2 У2 mins. (b) Speed. Aircraft of this type were required ultimately to be supersonic above 30,000ft. In the first instance, a maximum speed of M = 0.95 would be acceptable if this would shorten development time substantially. (c) Landing speed. 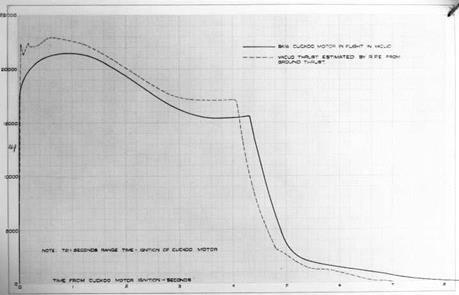 A low landing speed-this was more important than supersonic speed since landings would have to be made from the glide. (d) Armament: Battery of 2” air-to-air rockets, with provision for fitting direct hitting air-to-air guided Weapon as an alternative. November. Ministry of Supply accepted O. R.301. O. R.301 by specifying that provision should be made for carrying Blue Jay [an air to air infra-red homing guided missile]. February. Ministry of Supply circulated the specification widely to aircraft firms… Tenders were submitted by Bristol, Fairey, Blackburn, A. V. Roe, and by Westland and Saunders Roe. While firms were preparing designs, the Air Staff decided to ask for an ancillary jet engine to assist the return to base phase. July. The Tender Design. Conference decided to recommend to C. A. that three prototypes each of the Avro and Saunders Roe aircraft should be ordered. October. Ministry of Supply raised a Technical Requisition to initiate contract action. May. Ministry of Supply awarded a contract for three aircraft to Saunders Roe. The history of the Avro design is not followed in detail hereafter. August. … The target date for the aircraft to be in service was 1957. January. For reasons of economy, the Ministry of Supply order was reduced from three prototypes each from Saunders Roe and Avro to two prototypes each. June. The Ministry of Supply forecast the first flight of the first Saunders Roe prototype for July 1955. January. The D. R.P. C. decided that for reasons of economy, either the Avro or the Saunders Roe development should be stopped. The Ministry of Supply made a study of the relative merits of each aircraft and its development potential. March. D. M.A. R.D. (RAF) concluded that the Saunders Roe aircraft was likely to be more successful and would have an attractive performance in its developed form. July. A. C.A. S.(O. R.) recommended to D. C.A. S. that the Air Staff should support the Ministry of Supply’s proposal to abandon the Avro aircraft. The first prototype SR53 is expected to fly in July, 1956. March. Delays have been due to two main reasons, each of which would have held up the first flight date. (a) The fuel and designing a HTP system were more difficult than was first realised and required a large amount of testing. (b) Development of the Spectre rocket has slipped and the engine has not yet been airtested. Tests with a Canberra are expected to begin in March, 1956. O. R.301. A. C.A. S.(O. R.) suggested that the O. R.301 prototypes might be used to provide early technical information for building a more advanced aircraft on similar principles. February. Saunders Roe submitted a brochure to the Ministry of Supply proposing that a jet engine of similar thrust to that of the rocket be fitted to the aircraft being built to O. R.301. June. Ministry of Supply asked R. A.E to assess the performance of the aircraft proposed by Saunders Roe when fitted with a Gyron Junior engine. February. Ministry of Supply raised a Technical Requisition for design studies of the possibility of using an engine of 7,000 to 8,000 lb. thrust in the P.138D. August. Air Staff circulated Draft O. R.
September. Ministry of Supply issued a further contract instructing the company to proceed with fullscale design, pending a main contract, on the basis of the Draft O. R.
The flexibility given by A. I. [Airborne Interception], navigation aids and auto­pilot facilities was essential. The aircraft was required in service as soon as possible and not later than July, 1959. February. D. R.P. C. accepted the S. R.177 as a development project for RAF and Navy. Ministry of Supply sought Treasury approval to place an order for a development batch of 27 aircraft. As this was not readily forthcoming, in April the Firm was authorised the expenditure of a further £100,000 to maintain continuity. February. The two S. R.53 prototypes are now regarded primarily as a lead in to the F.177, rather than as a research project. July. Specification [handwritten: F177 to meet OR337] issued by Ministry of Supply. Treasury agreed to a development batch of 27 aircraft, but authorised the build of only 9 aircraft with long dated materials being allocated to support the remaining 18 aircraft. The delay in Treasury approval being granted was due to reviews of patterns of fighter defences of the future, and the atmosphere of financial stringency and economy generally. The S. R.53 has not yet made its first flight. The first F177 (SR177) is scheduled to make its first flight in April 1958, but this is likely to slip by 6 months. September. Ministerial approval having been granted, O. R.337 is formally accepted for action by the Ministry of Supply. Design work has however been proceeding since September 1955. The main adverse effect of the delay in placing the final contract has been that it has prevented Saunders Roe placing sub-contract orders. March. The first flight of the S. R.53 remained “imminent” until the end of 1956, but it has not yet flown and is scheduled for mid-April 1957. There have been troubles with the Spectre engine, but the airframe also is not fully ready. [handwritten] 29th March. Air Staff cancellation of OR337 was formally sent to the M of S [Ministry of Supply] on the 29th March. Liquid fuel rockets need a fuel and an oxidant. The UK used kerosene as a fuel almost exclusively, although a lot of work was done on liquid hydrogen, but sadly no use was made of this work. HTP (High Test Peroxide) was the most common oxidant: this was an 85% solution of hydrogen peroxide (H2O2) in water. The hydrogen peroxide decomposes to steam and oxygen on a catalyst (silver mesh gauze) and kerosene injected into the resultant hot gases ignited spontaneously. However, Blue Streak used engines (see Figure 1 below) licensed from the US and re-engineered, which burned oxygen and kerosene. The measure of the effectiveness of a rocket motor or fuel combination is called Specific Impulse. This was always written in documents of the period as S. I., but nowadays is usually written as Isp. This can be defined in many different ways: one is thrust times burn time divided by mass of fuel burnt. Another way of looking at it is the thrust obtained from each pound of fuel burned per second. The HTP/kerosene combination had a relatively low S. I., around 210-220 at sea level. Oxygen/kerosene gives an S. I. of around 245 at sea level. The effectiveness of a rocket motor is increased at high altitude or in vacuum. This is because the thrust from a rocket engine derives from the pressure difference between the pressure inside the combustion chamber and the pressure outside. In a vacuum there is no outside pressure. Thus S. I. is sometimes quoted at sea level and sometimes in vacuum. Vacuum S. I. is typically 10-15% higher than sea level. Hydrogen/oxygen is the most effective combination of all, reaching S. I.s of at least 400. This means double the thrust for the same weight of fuel (and burn time). Against that, there are weight penalties in the use of liquid hydrogen, since it has a very low density and needs large tanks. It is also very cold, boiling at -253 °C or 20 K, so the tanks usually need extra insulation, which in turn implies a further weight penalty. Figure 1. Rolls Royce RZ 2 rocket motors in a test stand at Spadeadam. Figure 41. 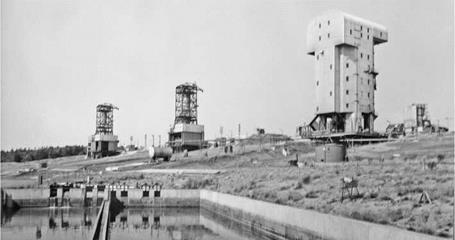 Rocket test stands at Spadeadam. Spadeadam was built by the Ministry of Works under the supervision of the Ministry of Supply. It was one of the few areas of the whole MRBM programme over which the Treasury had direct control. (It was probably also the most expensive – the estimate of the cost at the time of cancellation was around £24 million). They kept spending under a tight rein, an example of this being when PFG Twinn of the Ministry of Supply wrote to the Treasury asking to be able to spend up to £10,000 on particular items without seeking direct Treasury authorisation. Reluctantly, the Treasury agreed. We approve the purchase of the Ford Consul, but would be grateful if you would substitute a Ford Popular for the proposed Ford Prefect. Hundreds of Populars are in use in Government service, and we would rather keep to this cheaper 4-seater model. It really is quite extraordinary that the ministries should be debating the relative merits of a Ford Prefect or a Ford Popular. One cannot quite see the same problem arising at Cape Canaveral. In July 1959, an official from the Treasury, Mr JA Marshall, set off to inspect Spadeadam in the company of Mr William Downey from the Ministry of Supply. ‘The visit was enjoyable (in spite of almost continual rain) and instructive,’23 he remarked. … what I would regard as some extravagance. This is in the housing of the lines which run from the control and recording centre to each of the four stands. It has been put wholly underground. in a tunnel some 400 yards along. Other cables had been put in an over ground duct. Mr Marshall enquired why this had not been done here. He was told: ‘. had it not been so placed, it would have obscured the view of those in the control centre’. It also had to be carried under a road, but Mr Armstrong was not entirely convinced it had been necessary to put the entire length of cable underground. Mr. Downey had the courage to ask the schoolboy question: “Which is the button which actually sets it going?”. The scientist who was showing us round was utterly at a loss for about a quarter of a minute! There were other problems. ‘Commander Williams, the senior Rolls Royce representative, who is the general manager of the place, had a go at me on two minor things’. This related to the housing which had been built for those working at Spadeadam. He also thought we underestimated the difficulties they faced when we insisted on a certain proportion of the houses having two bedrooms instead of allowing them to be all three, or in a small number of cases, four-bedroomed. How much was the Treasury saving? Mr Marshall noted that ‘… the additional capital cost of the three bedroomed house is only £70 …’, but on the other hand, ‘we get an extra 5s. a week rent back from it’. 5s. means 5 shillings, or 25p in decimal money. The extra room would have paid for itself in just over five years. If Blue Streak had gone ahead in its military guise, then a considerable number (no figure has been found, but a reasonable estimate might be between 10 and 20) of experimental and proving vehicles would be needed, as well as the 60 or so production missiles, starting in 1960 and ending by about 1966. Somewhat optimistically, the development schedule had called for the first missile to be fired from Woomera around mid-1960. As it was, the first vehicle was not fired until 1964, and there were a total of 11 firings by 1971 (in practice, more were built and tested, as there were some basic, non-flight, development vehicles, and also some which were used to check at the sites at Woomera and Kourou). Thus after the cancellation, the tempo of work slowed considerably, and only one of the missile test stands, C3, was completed. There were also inevitable redundancies and a considerable drop in morale. In May 1967, Val Cleaver, Chief Engineer of the Rocket Department at Rolls Royce, wrote of the need ‘to raise morale and inspire some confidence in the future of the establishment’24, but apart from the test site for the liquid hydrogen RZ 20 motor, no further development work was carried out at Spadeadam. Figure 42. RZ 1 chamber on P site at RPE Westcott. Spadeadam would take time to build, so whilst it was being constructed, Rolls Royce used the P stand at Westcott for preliminary testing of the Rocketdyne derived RZ 1. Most of the runs were of very short duration – usually just a few seconds. Progress was delayed by a spillage of liquid oxygen onto the steel girders, which caused them to crack. One of the longest test runs was also the last, on an open day at which the Press was present. A motor was fired for 20 seconds, and on being checked after the firing, it was found that the gear box between the turbines and the pumps had disintegrated. A fraction of a second more, and the firing might have become very spectacular. Hertfordshire, large structures were built to house the testing of early, non-flight vehicles. These were for checking the strength of the vehicle structure and for such tasks as determining whether half a ton of fuel could be pumped from the tanks each second. 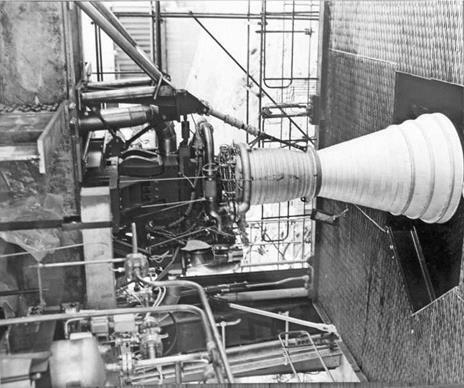 Engine testing was carried out separately by Rolls Royce, first at a test site at Westcott and then at the purpose-built facility at Spadeadam in Cumbria. Here, in addition to engine development, assembled vehicles could be static fired. Once tested, they would then be taken apart for transport to Woomera. Transport proved to be a difficulty. The large size of the tanks meant that very few aircraft would be suitable, and those which were, such as the Bristol Freighter, had limited range. This meant a great many countries would be overflown on the route from the UK to the Antipodes, and, given the nature of the cargo, political difficulties were foreseen. The problem was solved when the RAAF bought Fockheed Hercules aircraft: one of these could be leased from Australia for the purpose. And given the extra range of the Hercules, the overflying problem could be reduced by going westward round the world, over Canada and the US. As it would turn out, the tank of the first missile was at Fos Angeles when the cancellation was announced, and it was returned to the UK. All subsequent civil vehicles were transported by road and sea. October 1956: ‘There does not yet exist, I believe, anywhere in the world a gyroscope suitable for Blue Streak.’26 This was not quite true: American gyroscopes were very much more advanced, and Ferranti was eventually given the job of adapting Kearfott gyroscopes for the guidance system. Although these were probably not the best the Americans had under development, they were perhaps the best they were prepared to make available to the UK. And in November 1956: ‘It will thus be seen that, though the Blue Steel situation is parlous, the Blue Streak position is even more desperate’. A working design was finally produced, although in the end it was never used: the guidance system was cancelled at the same time as the missile. A satellite launcher needed a much less complicated system, and scrapping the Blue Streak inertial guidance could save money. As the 1960s progressed, inertial navigation was to become much improved: a system designed for the TSR 2 aircraft was adapted for Black Arrow. Blue Steel was left to soldier on with a much earlier design, which, with its valves, was very power hungry. Again, the penalty was being paid for being early in the field. 23 TNA: PRO T 225/1424. ‘Blue Streak’ medium range ballistic missile: test site, Spadeadam. JA Marshall 10 July 1959. 24 TNA: PRO AVIA 92/232. Spadeadam: liquid hydrogen-liquid oxygen thrust chamber test facility. Cleaver to CGWL. 25 TNA: PRO AVIA 54/2135. Blue Streak development: inertia guidance. Two stage. Launched 6 August 1964 at 02:45. Apogee 374 miles. This was the first launch with the Gamma 301 motor rated at the full thrust of 21,600 lb, and all vehicle systems were successful. The re-entry head for this flight was a copper sphere, which was recovered the next morning. Although it had split into two and had been scored and dented by the impact with the ground, it was in surprisingly good condition. The political, technical and financial fiasco that would become ELDO grew from an act of political cowardice by the British Government. In an attempt to deflect some of the criticism that he knew would come its way after the Blue Streak cancellation, Watkinson had announced that development would continue as a satellite launcher. This was a disastrous move from several points of view. Firstly, it deflected very little criticism. Very few people were interested in Blue Streak as a satellite launcher, but they were interested in the effect the cancellation might have on the Government’s defence policy. Secondly, the popular enthusiasm for a satellite launcher was small to non-existent. Thirdly, even civilian development was going to cost a great deal of money, and fourthly, there was no demand for a satellite launcher. It looked very much as though it might become a white elephant before it was even built. 1. All firings to be done at Woomera. 2. Offer to divide satellites for initial programme equally between partners, each paying their share of the cost. 3. The French to make the third stage boost. Despite Heath’s objection, a party of French engineers visited London on 29 September, moving on to Farnborough on 30, September followed by a much longer four day visit in November, when the itinerary included Hatfield, Ansty, RPE, Spadeadam, Cowes and London. (a) That they will join us in an approach to other countries in Europe. (b) That they remain uncommitted at this stage. (c) That they want to make a good slice of the composite rocket themselves. (d) That it will all take a long time to arrange. Then it was the turn of the British to go to Paris in January 1961. The record of the meeting begins with the sentence: ‘M. 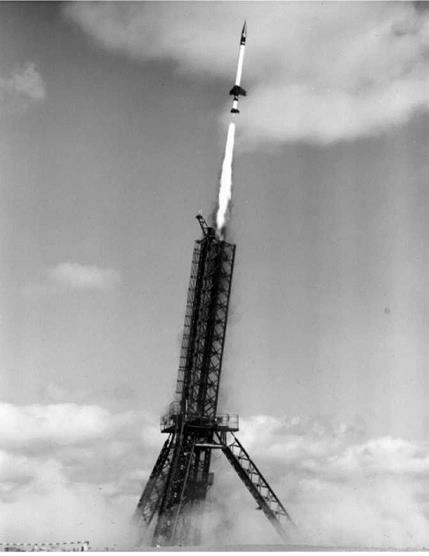 Pierratt opened the discussion by stating that the French had received instructions from top level on Wednesday last to work at a joint solution with the British for a European space launcher’ (‘top level’ being interpreted by the British in this context as meaning General de Gaulle himself). UDMH and N2O4, although the French admitted when asked what experience they had with these propellants: ‘… very little indeed. They had fired some engines of a research size for very short durations only’. French said they would try to work out these costs this evening and on Saturday morning. They would have to go carefully into the savings to be made on the military investment and the question of British help in this field was of major importance. These are exactly the questions one might expect, although if the French were intending to produce a solid fuelled missile, some of the items such as sloshing would become redundant. It is unlikely that Britain could have given much help on large solid motors. Some of the other items were ones which had given particular difficulty to the British only two or three years before – inertial guidance and re-entry in particular. (b) It is now joint UK/US information. (c) It is agreed by the US to be much better than their designs as regards invulnerability and US has now copied it. Radar Echo. Information on this is mostly Top Secret and would be of great value to the French. The most advanced work in this field is British and is acknowledged by the US to be ahead of their work. It is thought that future US warheads may be based on this British work. Release of this information would be contrary to I and II of para 3 in that it could provide an enemy with a ballistic weapon against which we see no defence and it would prejudice American weapons. It is desired to draw particular attention to this point and it is recommended that this information should not be released. Details of shape, weight, dimensions, etc. of the Blue Streak re-entry head cannot be discussed as they contain “atomic” information. ‘since August  no approach to UK firms to start design of the second and third stages has been permitted, partly to avoid compromising our negotiating position in Europe’. Using a French second stage would increase development time, and CGWL felt that this ‘now gives enough time to develop a liquid hydrogen 3rd stage’. … if the French chose a liquid motor for the 2nd stage, and if they followed their present lines of development, the performance of their 2nd stage would again be appreciably lower than that of Black Knight. This is due to the fact that the French have not developed high performance turbo pump fuel systems on UK or USA lines and, for their weapon development, are not prepared to face up to their technical complexities. They intend to use the cruder method of gas pressurisation of the fuel tanks as a means of pumping the fuel. The resultant penalty in tankage weight is considerable. Participation by other European countries in the Space Club is essential. Hence I suggest that development of the liquid hydrogen 3rd Stage should be offered to a consortium of European countries with some UK technical participation in the development teams. We are in favour of proceeding with a French 2nd stage and a European 3rd stage, recognising that by so doing the completion date for the European launcher will be delayed by perhaps Ш years and that the total costs may rise by perhaps 10-15%. After the British Prime Minister’s Statement in May 1959 that an investigation would be made of the adaptation of British rockets for satellite launching, extensive studies of the capabilities of Blue Streak, in combination with other rocket stages, have been made by the United Kingdom Ministry of Aviation at the Royal Aircraft Establishment, Farnborough. The later proposal that a satellite launching vehicle system based on a Blue Streak as a first stage should be developed as a joint European and Commonwealth effort, has recently caused these studies to be extended by joint Anglo-French investigations into a design incorporating a French second stage. The original British proposals were put to representatives of European nations at Church House, Westminster, London on the 9th and 10th January, 1961. At Strasbourg, during the week of 30th January to 3rd February, a preliminary description of a joint Anglo-French proposal was presented for the consideration of representatives of a number of European nations. One of the guiding principles of the United Kingdom studies was the minimisation of cost, particularly capital cost, and thus the greatest possible use should be made of existing equipment and facilities, including the rocket ground testing and development facilities at Hatfield and Spadeadam, in England, and also the launching and other range facilities at the Weapons Research Establishment, Woomera, Australia. France, on her side, has undertaken an extensive national programme of basic studies and development of ballistic missiles. The French proposal for a second stage, later to be described, is closely related to this programme in order, again, to minimise cost, delay and technical uncertainty. This brochure contains outlines of the jointly proposed satellite launching vehicle and its systems as they stand at February, 1961. The opportunity has been taken since the Strasbourg meeting to bring the proposals into accord with the latest technical information. The assessment work which will lead to a full design study is by no means complete, depending as it does considerably on the parts of the work to be undertaken by the European nations involved. All aspects of the combination of the French second stage with Blue Streak have not yet been completely examined. The brochure, therefore, contains the joint Anglo-French proposals as far as they have gone, and where the necessary work has not been completed, the parallel work done on the original British configuration has been referred to. In the absence so far of an alternative proposal for the third stage, the third stage described is the original UK proposal. (i) A large satellite weighing between one and two thousand pounds in a near circular, near earth, orbit. This satellite would be space-stabilised with a primary purpose of making astronomical observations above the earth’s atmosphere. (ii) A smaller satellite of several hundred pounds weight, moving in an eccentric orbit out to two or three earth radii, for the investigation of the earth’s gravitational, magnetic, and radiation fields, and the constitution of the earth’s outer atmosphere. (iii) A satellite of the order of one hundred pounds weight, in a highly eccentric orbit reaching out to about 100,000 miles, to carry instruments for the study of the sun’s atmosphere. These aims have been subsequently extended to cover the possible launching needs for Satellite Communication Systems and this has led to the consideration, in addition, of circular orbits at several thousand miles altitude. Figure 62. The Anglo-French proposal. This is effectively the Black Prince design with a French second stage. The first three objectives are taken from the Saunders Roe brochure for Black Prince, published a year previously. It does highlight an absurdity of the programme: £60 million for three satellites does seem excessive. The communications requirement is new, and the Saunders Roe liquid hydrogen stage was optimised for just such a role. The main problem was that even 5,000-6,000 miles was still too low an orbit for communication satellites. RAE and others tried looking at 8-hour or 12-hour orbits, but it is only the geostationary orbit which is of any practical use. Figure 63. The French proposal for the second stage (the final version would be very similar, except that the one large chamber would be replaced by four smaller ones). Studies indicate that it is possible to inject a satellite into orbit using the proposed two stage combination but this would necessitate a long coasting period after perhaps 90% of the second stage propellants had been burnt, followed by a relight of the second stage engine to inject both satellite and empty second stage into orbit. This approach introduces problems of relighting the engines under zero acceleration as well as the necessity for ensuring correct orientation of the second stage at engine relight. Though such problems have been solved in other satellite launchings, the two stage vehicle would give considerably reduced payloads and would be unable to put any payload into higher orbits. The preferred approach is therefore to introduce a small third stage rocket. This is sometimes referred to as a vernier stage. 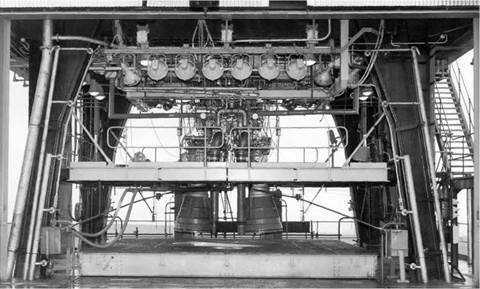 The engine of this stage, working at a relatively low thrust level of between 1000 lb and 2000 lb would be started during separation from the second stage and would continue to burn through what would otherwise be the coasting period, cutting off when orbital altitude and velocity had been achieved. The low weight of the third stage structure and engines, compared with that of the relit second stage, affords considerable improvement in payload weight into low orbits and makes possible the injection of payloads into very high orbits. It is possible to meet the several orbital requirements by exchanging satellite payload weight for propellent weight in the third stage whilst maintaining constant the overall weight of the third stage plus satellite payload at some 5000 lb; that is, the third stage incremental velocity can be increased at the expense of payload. The tank volume is altered to suit the orbital mission allowing the remainder of the third stage, including the engine, and all equipment, to remain sensibly unchanged. For the configuration just described, with a take-off thrust of 300,000 lb weight a satellite of 2,160 lb may be put into a 300 mile circular polar orbit. Corresponding payloads for elliptical polar orbits, both with perigee heights of 300 miles, and apogee height of 7000 and 100,000 miles, are respectively 910 lb and 320 lb. For a typical high altitude equatorial orbit (launched near the equator) at, say, 5000 miles altitude; a payload weight of 700 lb is calculated. These are ‘nominal’ payloads making some allowances for weight growth of the launching vehicle. It would be prudent, however, to assume that actual payloads would be perhaps 200 lb less than these nominal values to allow for unforeseen contingencies. The negotiations were not easy. Enthusiasm for the project in Europe was very limited. 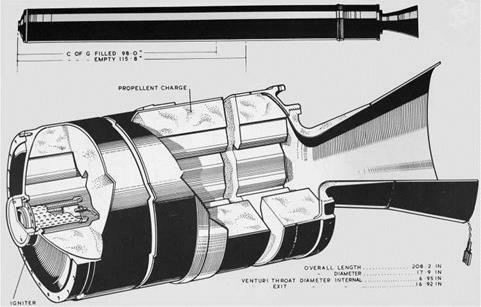 Indeed, in May 1961, Thorneycroft asked Mitchell what needed to be done to go ahead with an all-British launcher, and received a reply saying that it would be quite straightforward with the original HTP design, with or without the liquid hydrogen stage. Even Australia seemed to be making difficulties, and Thorneycroft took the unusual step of writing to Mitchell to ask whether it was feasible to launch Blue Streak from Spadeadam! Spadeadam is technically both feasible and attractive. From the cost point of view, it is approximately the same as Woomera, and is much cheaper than any alternative. It must be accepted, however, that some cut-downs on to UK territory would inevitably occur if we fire from Spadeadam. The chance of serious damage to life and property from such cut-downs are numerically small. The risk of damage to foreign countries, or to shipping, is negligible. As Mitchell says, the crucial point is political acceptability. The thought of launching a rocket as large as Europa from an inland site in Britain is one which should fill any politician with horror. The repercussions from an accident would be horrendous. There is also another technical point. Mitchell describes the launch direction as ‘North 15 East’, or 015° in modern parlance. To be restricted in launch direction in this fashion very much reduces the value of the site (and this also applied to Woomera). Different satellites fulfilling different roles need different orbits. It certainly would be useless for communication satellites. Fortunately, agreement was reached with the Australians, and Woomera would indeed become the launch site for the first ten launches. Although several European countries sent delegates, most of Thorneycroft’s efforts were devoted to persuading the German and Italian Governments to join the project. Both countries were reluctant; the Italians wanting to reserve their money for their own national programme. Belgium and the Netherlands were willing to participate, but their contributions would be small. Denmark had taken part in the discussions but decided in the end not to join, but again any Danish contribution would not have been very significant. After further protracted negotiations, Germany agreed to join, and would build the third stage; the Italians would provide the satellite fairings and the Satellite Test Vehicle (STV). Thus the final membership of ELDO consisted of the UK, France, Germany, Italy, Belgium and the Netherlands, with Australia making the seventh member. Australia would make no direct contribution, but would instead develop the Woomera launch site. ELDO came into formal being in March 1962 by a Convention which was signed by the seven Governments and which came into force on 29 February 1964 after ratification by the signatory states. The headquarters were in Paris, and it was governed by a Council that had two representatives for each member state. The Council was assisted by an International Secretariat under the direction of a Secretary General, with two Deputy Secretaries General, one in charge of technical affairs and the other of administrative affairs. The staff of the Secretariat amounted to around 180 people in 1965. But while design work for the new launcher had started, ELDO itself was already running into serious political trouble. Indeed, it would spend most of its existence staggering from crisis to crisis, either technical, financial or political. By 1964, the design of the vehicle had finally been decided12, and work was beginning on the design and construction of the upper stages. The French then dropped something of a bombshell by stating ELDO A was inadequate, that it should be dropped, and that the organisation’s efforts should be directed towards a new launcher, ELDO B.
the reluctance of the other countries was understandable. The British Government had by now become actively hostile to ELDO, and there were hopes that French intransigence might bring about the collapse of the organisation. as regards ELDO B no commitment could be considered until much more information was available. There were attempts at a compromise. One was to proceed with what was called ELDO A(1+3), to keep the programme going whilst work began on ELDO B. This was a proposal to put the German third stage on top of Blue Streak – hence the (1+3) designation. This, it was thought, could put 300 kg into a 500 km orbit. Use of an apogee motor would enable payloads to be put into highly elliptical orbits, which might suit some of the proposed European Space Research Organisation (ESRO) requirements. Given that the German stage was the least well developed part of Europa, this too was somewhat optimistic. The 1+3 programme would provide for development of basic techniques, establishment of facilities, and experience by personnel as a foundation for the ELDO B programme including proof of the first stage and engines; development of throttled engines, live-stage separation; instrumentation, safety, nose-fairing and STV separation, and inertial guidance. This is work which can only be carried out in a vehicle based on Blue Streak. The studies so far undertaken, necessarily limited by time, give the Secretariat good grounds of assurance that the programme is technically feasible. b) ESRO requirements for the launch of small satellites, i. e. those within the launching capacity of Thor Delta. It was a proposal that died together with ELDO B. A 500 kg payload is quite respectable, but whether it would be worth using a launcher as expensive as the (1+3) scheme is debatable. A sketch of the proposed vehicle is shown on the left. The (1+3) programme was intended to run in parallel with the ELDO B development, but ELDO B was abandoned as a result of the Intergovernmental Conference in July 1966. Instead, a new five year programme was drawn up, starting in January 1967 at an estimated cost of 331 MMU. (1 MMU was effectively the same as 1 US dollar, so at the then rate of exchange this was a little less than £120 million.) 10 MMU were set aside for ‘studies and experimental’ work – ELDO B was not entirely dead yet. would be fired to put the satellite into a highly elliptical geosynchronous transfer orbit. The apogee motor would convert the elliptical orbit into a circular orbit. A geosynchronous orbit required a launch site close to the equator – and Woomera was too far south. The launch corridors from Woomera were very restricted by the centres of population below the flight path. ELDO set about finding an alternative site, and the two main contenders were Kourou or Darwin, and, as we shall see, Kourou was chosen. So a new launch site for Blue Streak was built in the depths of the South American jungle. The last launch of Europa from Woomera was F9, after which Australia left the organisation. A non-flight model Blue Streak, known as DG, was taken out to Kourou to test the facilities. F11 (there was no F10) would be the first launch from South America, the first with the PAS operational, carrying a communications satellite for France, and the last ever launch of Blue Streak and Europa. R3 was dispatched to Australia early in 1971, and the second stage arrived at Woomera on 26 July, followed by the first stage on 17 August. Static firing of the second stage occurred on 1 September, and the two stages and the back-up satellite had been assembled by 1 October. The complete vehicle was given a static firing test on 8 October, and the flight model satellite was fitted by 22 October. A decision was made to delay the launch until 26 October, but systems checking delayed the launch further. Derek Mack, one of the Saunders Roe launch team (Saunders Roe had by then become the British Hovercraft Corporation), remembers the morning of 28 October as a cool, fresh Australian spring day, with clear skies. The overnight crew had filled the HTP tanks and adjusted the kerosene levels, as well as arming the many pyrotechnic systems on the vehicle. The gantry was wheeled back at 11:00, but there was some alarm when the Attitude Reference Unit, which steers the vehicle, began to give erratic signals. There was relief when it was realised that this was due to the vehicle swaying gently in the light breeze. The vehicle lifted off smoothly, and the various telemetry stations north of Woomera reported that all events had been successful. However, this did not yet mean that the launch had been successful: it was only when the global satellite station at Fairbanks reported an operational signal from a satellite on a frequency of 137 MHz that the team knew that they had an orbiting satellite. The party could begin, but there was a sour taste to it. R3 launched the Prospero satellite (X3) into orbit on 28 October 1971, in a text book launch.19 The programme had meanwhile been cancelled by an announcement in Parliament by the new Minister at the Department of Trade and Industry, Frederick Corfield, on 29 July 1971. The teams that had built Black Arrow and launched it were out of a job. (a) To determine the thermal stability of a number of new surface finishes. (b) To determine the behaviour of new silicon solar cells. (c) An experiment in hybrid electronic assemblies. (d) An experiment by Birmingham University to determine the flux of micro meteorites. The satellite was formed from eight faces covered with 3,000 solar cells. Since the spacecraft would be in the earth’s shadow for part of its orbit, rechargeable batteries were also carried. The fifth vehicle, R4, was never fired, and is now on display in the Science Museum, London. Single stage. Launched 30 October at 1959. Apogee 455 miles. BK06 was a repeat of BK05 with a similar head but using a tape recorder to record separation and re-entry data. Vehicle performance was good, a re-entry velocity of 11,220 ft/second being achieved at 200,000 ft. There was some thrust even after the eight seconds allowed between burn-out and head separation; this caused collision between main stage and head, initiated the ejection of the pyrotechnic flashes and deployed the parachute on the ascent instead of later, as intended, during descent. The tape recorder in the head was switched on correctly and covered the separation phase and later part of the re-entry. The tape cassette, with recordings intact, was recovered together with the eroded durestos nose cone. The paper that follows is the Air Staff description of the prototype Blue Streak underground launcher. The prototype was known as K11. 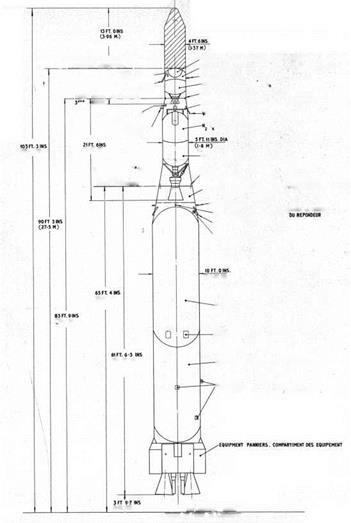 A drawing showing a full reconstruction of the launcher can be found in Chapter 6 (Figure 50). (1) The potential attacker is believed to have the capability to produce an explosion of 1 megaton yield on the ground or in the air with an accuracy of xh nautical mile from his target. The launcher must be able to withstand such an explosion and successfully fire its own missile without outside assistance within 24 hours. (2) The emplacement must be able to fire the missile in all weathers. (3) The emplacement must contain the missile and the necessary facilities for operating and servicing it and for messing and accommodating the concerned personnel. Since an alert may be sounded when the outgoing shift is handing over to the incoming shift, messing facilities must be adequate for two shifts. (4) Storage space for the missile propellant fuels, food and other stores and equipment must be provided. (5) Adequate ventilation including the efficient and speedy expulsion of missile exhaust after firing, must be provided together with facilities for conditioning, purifying and circulating air. (6) Insulation against the electro-magnetic effects associated with a nuclear explosion. (7) The emplacement must be self-contained for an emergency period of four days (covering three days before an attack is expected and one day afterwards). 1. Rock mass (hard chalk, limestone or better) not less than 300 ft thick and preferably with no overburden. But if overburden is present, it must be soft and not more than 25 ft thick. 2. Easy and firm access from main road to emplacement for transport of missile, equipment and stores. 4. Neighbouring inhabited property must be more than 3,000 feet from the emplacement (this may be reduced as experience is gained in K.11). 1. Basically, the emplacement consists of a hollow re-inforced concrete cylinder, 66 feet internal diameter, extending downwards from ground level to a depth of 134 feet and divided internally into two main sections by a vertical concrete wall. One section houses a U-shaped tube, the arms of which are separated by a concrete wall and are, respectively, the missile shaft and its efflux duct. The surface apertures of this U-tube are covered by a lid which can move horizontally on guide tracks. The other main section within the cylinder is divided into seven compartments, each with concrete floor and ceiling, for the various storage, operating, technical and domestic functions. 2. The internal diameter (66 feet) of the concrete cylinder is determined solely by what is to be accommodated. Protection against an explosion as… above is given by the lid and by the re-inforced concrete roof walls and foundations. The wall thickness will depend on the geological characteristics of the surrounding rock and may well be of the order of 6 feet. The depth of 134 feet is arrived at primarily to give sufficient clearance below the missile (itself 79 feet long) to allow for de-fuelling and re-fuelling the missile into and from the liquid oxygen and kerosene storage tanks located on the 7th floor. 3. A nuclear explosion produces certain electro-magnetic effects which could gravely injure the electronic systems built into the missile and on which its efficient functioning depends. To screen the emplacement from these effects the concrete cylinder will be wholly encased in W thick mild steel plate. 4. The shaft is octagonal in section, 25 feet across and has an acoustic lining. The octagonal shape, which has been proved by tests, will facilitate the mounting of the acoustic lining and of the four hinged platforms which are spaced at intervals down the shaft. 5. The purpose of the acoustic lining is to prevent damage to the missile from the extremely high noise level produced by the main thrust chambers in the confines of the missile shaft. 6. The missile rests vertically in the shaft on a launcher supported by four suspension limbs attached to the wall of the shaft. 7. Access to the shaft for servicing purposes is through blast-proof doors opening on to the second and sixth floor. 8. This has an area approximately 60% of that of the missile shaft and in section is half-octagonal in shape. This gives symmetry in the structure and at the surface aperture. A series of deflector plates at the exit will take the exhaust gases away from the missile as it leaves its own shaft. Storage, Operating, Technical and Domestic Section. (d) blast valves for all intakes and exhaust ducts. All this equipment has been centred as far as possible on this floor to avoid large air trunking systems being provided throughout the site. In the event of contaminated air being taken in, arrangements will be made to close off this floor (other than the general access facilities) thus allowing the generating and air conditioning plant to continue to operate without risk of contamination of the rest of the site. (a) Upper storage and maintenance area for the missile, together with two magazine type stores for the payload and the pyrotechnic equipment of the missile, i. e. retro rockets, head propulsion rockets, etc. (b) Certain items of heating and ventilating equipment for which space is not available on the first floor. (d) Blast proof access doors to the upper portion of the missile shaft. (d) Azimuth bearing and general purpose telescopes. This floor level is controlled by the relationship required between the auto­collimator and the inertial guidance unit in the missile. This floor contains all the general domestic accommodation including kitchen, recreation and sleeping facilities, etc., together with a small battery room and a switch room. This is intended as the main storage area for the site generally. It also contains one or two tanks which it is not practical to put in the tank room on the seventh floor. This floor is divided in two by a structural wall to separate the liquid oxygen and nitrogen systems from the kerosene and water systems. 1. The detailed design of the lid is about to form the subject of a special design study by selected firms. 2. The purpose of the lid is to protect the missile from the effects of attack and to remain fully serviceable itself after such attack. Since the missile is completely unprotected when the lid is open, the time allowed immediately prior to firing the missile for opening the lid must be kept to a minimum and has been put at 17 seconds. 1. The main requirement is to achieve maximum security and this calls for both the site and its immediate surrounds to be enclosed by a security fence and to be clear of obstructions to visions. The cleared area extends also beyond the site perimeter. The need to camouflage the site is at present being considered. A simple road system with associated hardstandings must be provided within the site. 2. The site will be about 3 acres in extent. 3. The site includes the main entrance to the emplacement, consisting of three flights of steps, protected only against weather and leading down to a cylindrical air lock giving access to the first floor of the emplacement.